All Endot pipe and tubing is producing PE-4710 Gas Pipe & Tubing from DOW Chemical's DGDA 2490 resin. Recent changes to ASTM D2239 and D2737 now provide a 25% increase in pressure rating for pipe and tubing meeting these standards and using PE4710 resin. For example, Endot pipe made to ASTM D2239 using PE 4710 with an SDR 9 rating is now rated at 200 psi and SDR 11.5 pipe is rated at 160 psi. 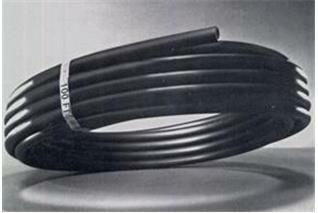 CTS tubing with a SDR 9 wall is now rated at 250 psi. Pumps installed on PE 4710 pipe can be hung deeper as a result of the 25% increase in pressure rating. In addition if the pressure rating is not needed a thinner wall and thus less expensive pipe can be used. PE4710 products have outstanding RCP and PENT (stress crack resistance) values that exceed all other products available. Produced in sizes from 1/2" through 8" in both IPS and CTS dimensions.